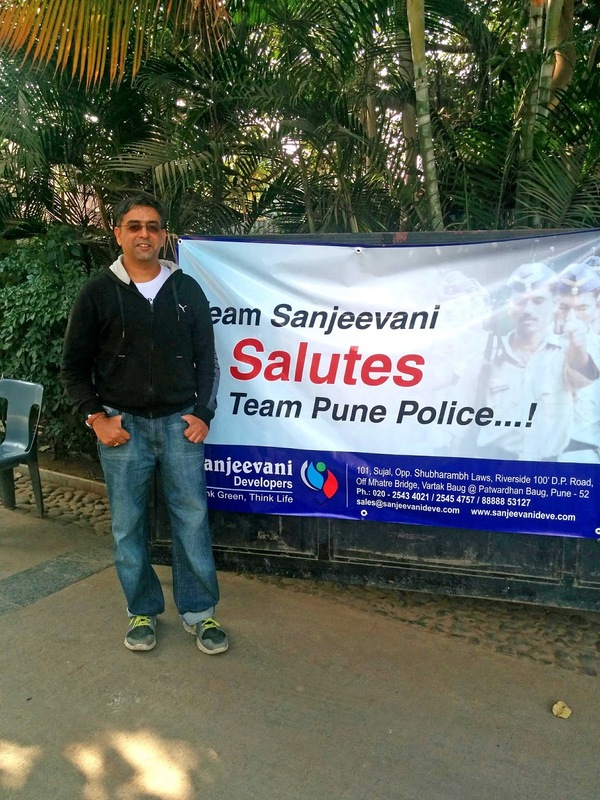 Vison of Life by Sanjay: Understanding The Man in The PoliceMan! Understanding The Man in The PoliceMan! Benjamin McLane Spock was an American pediatrician whose book Baby and Child Care, published in 1946, is one of the best-sellers of all time. Its message to mothers is that "you know more than you think you do”. And surely Benjamin’s quote about police tells us that even in country as advanced & civilized as USA, image of police force in the minds of common citizens isn’t much different than whatever it’s here in our country! In India with due respect to all its diversity, geographical as well social, yet one thing is common & that is image of the police forces in the society & no need what is that image! Out of ten hardly one person will speak good about police in private of course & it’s this image which made us at Sanjeevani to think about doing something for the police force! And in the vain when I wrote a letter to Director General of Police, to my surprise he not only just replied but responded; result of which I got a call from Pune Joint Comm. of Police & he called me to discuss what can be done to change rather say improve the image of the police in eyes of the common man. Agreed I am no saint to make miracles neither I wanted to become one but what I feel that we are number one, especially when it’s to criticize anything that to a faceless organization we call govt & on top of it when it’s police but when it’s time to actually doing something to improve the system then how many of us stood to that cause is a question! Here many will say why to show any sympathy to police, they are paid to do what they are supposed to do; some even goes to the extent that we are paying taxes & it’s our tax money which they take as salary so they have to serve us! Agreed, we all pay taxes & then we all are here to serve someone or other yet some jobs are above all as like army & police, they are getting paid as equal to a bank clerk or junior engineer but then army jawan & policeman can lose his life in doing their job, how many other services offers such threat to the service person? That’s why these jobs are special & so are the men who are doing such jobs! I thought of doing something to help police force to regain their glory, I don’t say they have lost all the glory but when nine out of ten people speaks negative about any organization then there is something wrong surely. And our image isn’t going to change by advertises which any way police department isn’t allowed to do but only by our own actions it’s possible. And who better than the constable, a lowest rank of the force which actually is on street & face the public to start with! 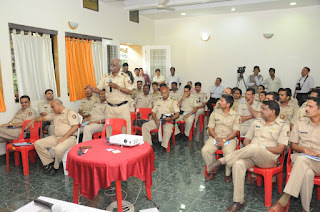 So I proposed that we will conduct a personality building program for the constables & sub inspectors of police force with the help of my friend Anuj Khare & his team who have worked on similar training programs for forest guards. Frankly we weren’t sure about the outcome as forest guards case is different, though extreme work conditions as well risks involved in the job are similar with that of police force yet police especially city police has to face lot of people where as job of forest guard is secluded from common people. So we decided to make the focus of entire training about communication skills as well make them understand importance of the job they are doing. The later part is for the new kids which has joined the force & are having higher educated as gone are the days when the constables popularly known as "hawaldars" used to hardly 12th standard pass & could barely speak in even good Marathi leave apart English. This new genre is well conversant with computers & many are science or commerce graduates. But then the education is curse some times as the job of a constable isn’t that easy except it’s a govt job. When they compare with their fellow friends doing much comfortable jobs in private in AC offices, then some where frustration creeps in! And police duty hours are erratic; expectations are very high, leaves unheard of with no family life & very poor facilities from the system which is their employer! All this makes you realize there is no fun to wear that “khaki wardi” along with three lions & then the frustration catches you. The outcome is you forget to smile, you are always angry with anybody who comes to you & on whom you can blow your anger easily which usually is some harmless common citizen & you surrender to some addiction! Best part was Jt. 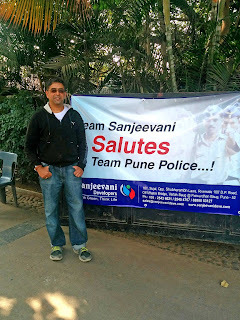 CP of Pune police i.e. 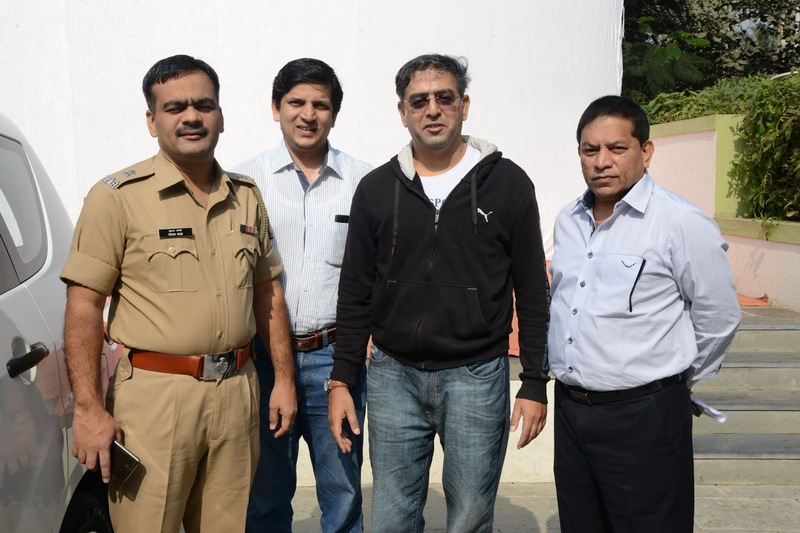 Mr. Sunil Ramanand, who not only listened the concept but immediately called his DCP Mr. Tushar Doshi & after a brief discussion we planned first session for Zone 1 police team which controls western part of city & the first ever training session was on! We then roped in people in the field of fitness i.e. Mr. Arun Yadav who is a well-known fitness trainer, Mrs. Meghna Pethe a working Executive in Forbes Marshal & expert of health care & hygiene. Anuj & Anand Kolarkar themselves decided to conduct team building & communication & for wild life awareness Mr. Nitin Kakodakar who is IFS officer & chief conservator of forest agreed to share his knowledge about wild life & gave a wonderful presentation about State’s wild life heritage. Here I will share just few reactions from the participants which will give idea about impact of the training. On day first some fifty odd policemen & women gathered at morning with a bit confused look in their eyes as what’s this training is for. We were at gate & welcoming to the participants & all came with typical grim face with no smiles (that way tell me when last time you have seen a smiling policeman?)! And when the training started in presence of DCP Tushar Doshi as well Shantilalaji Katariya, President of Credai Pune Metro, we briefed about the concept yet they were not sure what they are going to learn here. Next day when we were again at gate for welcoming the participants, everyone came smiling & said good morning to us! As in the training we specially asked them when last you have smiled at the person visiting police station & have said good morning to him? We didn’t surprised with the answer which was, "never"! 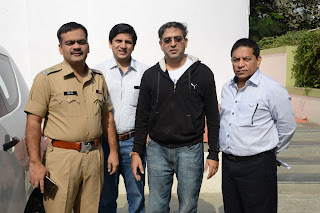 Anuj’s team made them play games in which some participants has to do role of policeman & some of criminals & some of complainants & other participant were to observe how they behave with each other; well, you could imagine the laughter they had identifying their own way of meeting people & flaws in that! They asked lots of question right from what is a white tiger to does the snakes fly & Mr. Kakodakr also happily answered each of them! Equally important was the sharing about fitness of mind & body & how a clean surrounding can make the same old work place better! I was surprised when a constable discussed with us about genetic changes & why if man is developed from monkey then the stages in between this development got vanished in the process, such were the questions & mood of the seession! They all were thrilled to have knowledge which they have never been exposed to, may it be health, hygiene, wild life or management! This is something other than just law & order & to make them better human being is what they realized. In the closing session we asked them to express what they felt, on this a senior constable who is due for retirement in coming year, said he has attended countless training programs but this he thought is the best of all & first time targeted towards the man in the policeman! Another constable shared in person that till now he used to think only DG’s & Commissioner’s are the brand ambassadors of the police department but today he realized he too is, rather he is the best brand ambassador the department can have! The lady constables also were happy & said they have realized how much knowledge of other things than just patrolling & crime control is important & refreshing to them! They sheepishly said, “Sir please tell our seniors to conduct such seminars every six months, it has made us feel so light & stress free!” Here I must mention one more thing, the food was by Shreyas hotel & Mandar Chitale & his team were all the time attending the participants & every participant mentioned that they are sweetly surprised by the quality of food as well serving way as never such care has been taken for their food needs neither at trainings nor when they are at bandobast! Many shared their personal experiences in the duty which they thought has made them a bit frustrated & angry against the system they are working but here after they agreed that they will face the duty with more positive mind & smile on face! Bet part was they opened up what they feel & in that process they started looking at the duty with more clear vision which is positive outcome! I think what that senior constable shared, speaks about the need of such training's i.e. understanding that man in policeman; we all expect a policeman to be always attentive & available for the duty but we conveniently neglect our duty towards that man in the policeman! And that is the cause for the gap which is ever widening between common man & the policeman as both thinks other should improve. Whether our effort was a success or not only time will tell but at least we tried is what more important! As it made myself, anuj & our team feel nice about our own self that though we are not wearing the khaki yet for a while we became part of it & I think we all have a policeman within, but problem is we expect others to do his duty! If we all understand & stood to that policeman in us then only we have a right to look for the man in any real policeman! And what was more important is, understanding of such efforts from the top bosses as the DG Mr. Pravin Dixit whatsapped me, allowing sharing his email address as well cell number with the participants so they could share their feedbacks about the training directly with him! To conclude, I will put up sharing from a young constable, when I joined them for lunch on second day, a constable in his thirties said, ”sir in service of ten years first time I went with a smile on my face & even slept with smile, just remembering the team games & training moments in the day, my wife was so surprised & happy to see me in this mood"! I think it’s the best ever compliment or feedback about our efforts; so I just smiled to him as that was the best comment I could offer to that Policeman on his sharing! Please leave ur name, email id along with ur comment. It will help me to reply ur comment as well improve the blog as per ur suggestions if any. Real Estate School Named Exhibition !! Home Buyer's, "Achhe Din" Are Here!